Near the end of the 1980's, the West German Army was looking to replace its stock of G3's in favor of something cheaper and fitting to NATO standards. 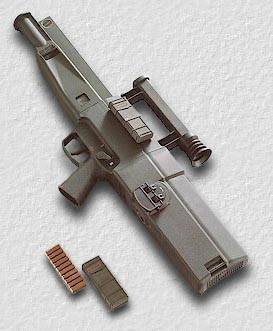 Heckler & Koch was tasked to develop a new rifle to replace the venerable G3, and so the G11 project began. Little information is available on the early days of the G11, but we do know that in 1988 final field testing were underway by the West German Army. The original G11 incorporated a 1:1x optical sight system which used a simple ring for faster target acquisition and subsequent engagement. This was integral with the carrying handle, and there were no back up open sights, because the manufacturers were confident that the robust design would not fail. 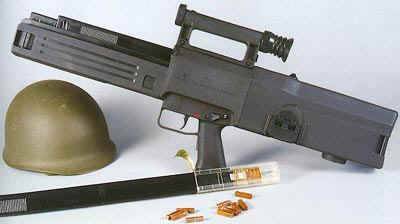 The prototype G11 came with a fifty round magazine This was later reduced to forty-five. New recruits were to test the functionality of the G11, and they averaged 50% more hits with it over the G3. The simpler design also made for faster recruit familiarity with the weapon. All units, from Airborne to reconnaissance tested the G11 for usefulness, while technicians at the Army Ordinance center tested it for accuracy, durability and safety. This went on for almost two years, and the subsequent result was the G11K2. This version was a modification based on troop input which carried three loaded magazines on the weapon. With 135 rounds of ammunition on it, it weighed just under ten pounds. The center magazine feeds the weapon, and is quickly changed when dry. Although the fixed sight could not be removed from the weapon, the universal input on the nose allowed fixing of a bayonet, bipod or laser sight. Tests against the East German MPiK were conclusive that it was no match for the G11. The German Army submitted their test results to the Defense Ministry, stating that they were quite satisfied with the G11's performance. By 1990, it looked as if the G11 would become the replacement rifle for the G3, but a German government tradition was to have it otherwise. The German government funds revolutionary new projects, then sees them through to 90% completion, then decides that they cost too much, and completely scrap them. They did that with the magnetic rail train, which ended up being scooped by the Japanese, who made a good profit of it. The same went for the G11. The German Government took the axe to the project when it was by all virtue, complete, saying that it was too expensive to finish. The G11 was being eyed by the U.S. as a possible replacement for the M16 and M249 already, but nobody adopts a weapon unless the native country does so first. H&K now found themselves in a tight situation: the government had cancelled the project that they had spent the last five years developing, and the Army was getting antsy for a rifle, because the G3 was already being phased out. In their rush to come up with something to keep their Army contract, H&K modified the AR18 action and put it into a new frame, calling it the G36. The traditional and more reliable roller-delayed blowback system was ditched, as was the revolutionary new caseless ammunition. The German government settled for a mediocre half-way between the two. The G11 and the caseless project entirely was permanently cancelled in 1992, in a sad ending to what could have been a history making rifle which had no equal anywhere.